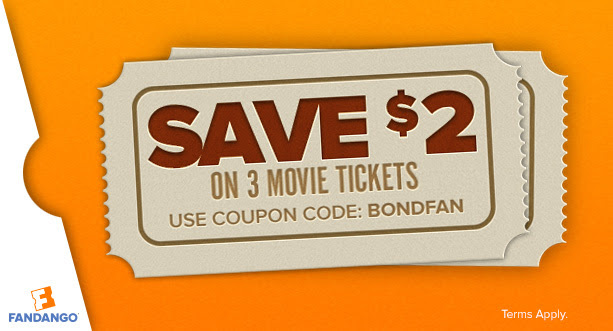 Get $2 off your purchase of 3 or more tickets to any movie this week with promo code: BONDFAN. Offer valid 11/2-11/5 11:59 PM PST or While Supplies Last. Terms Apply. Terms and Conditions: Fandango Promotional Code BONDFAN is good for $2 off your entire purchase of 3 or more movie tickets to see any movie at Fandango partner theaters in the U.S. This Offer is valid for purchases made between 12:01 AM Pacific Time ("PT") on November 2, 2015 and 11:59 PM PT on November 5, 2015, while supplies last.